This is the first in a series of articles about the role of vision and optics in VR. Today you learn how lenses for virtual reality headsets work but you first have to understand how our eyes work. Our eyes have built-in lenses that sit behind the pupils, the black part of our eyes. On the back of our eyes we have receptors that translate the incoming light into useful information and enable us to see. The job of the lenses in our eyes is to alter the incoming light in a way that it gets focused on our receptors on the back of our eyes. The lens bends depending on the distance between your eyes and the thing you are focusing on. If you look at something really close your lenses have to bend a lot to give you a sharp image. If you look at something in the distance the lens does not need to bend a lot. That’s also why when you work a lot in front of a computer, you should take breaks at least once an hour and focus on something in the distance. This helps prevent eye strain because it gives your lenses a chance to relax. As your eyes age the lenses become less able to bend and alter the incoming light, which is why teenagers can focus on things as close as 7 cm in front of their eyes but older people cannot. So, we humans have difficulty looking at virtual reality head mounted displays (VR HMDs) that are 3 to 7 cm in front of our eyes. That’s why we need lenses in VR HMDs that bend the light and make it easier for our eyes to see. The HTC Vive uses Fresnel lenses and the Oculus Rift CV1 has hybrid Fresnel lenses to keep the lenses thin and bend the light in a way that helps us to see clearly. Prescription lenses for glasses that fix problems such as astigmatism, myopia or hyperopia work in the same way. They correct the incoming light and make it usable for you again. Check out the video below for more details and to understand the limits of our current Fresnel lens technology. Want to get the next article straight to your inbox? If your eyes focus on something far away, they focus on infinity. That means the rays of light are parallel and the lenses of your eyes are relaxed. If an object like this little fly moves closer to your eyes and you want to keep it in focus your lens bends and breaks the light differently. To keep the fly in focus all the light from a single point on the insect needs to be focused on a single point in the back of your eyes. If the fly comes too close the lens cannot bend enough and you lose focus. This is why VR HMDs need special lenses, so the angle of the light from the lenses is corrected so that it can be used by our eyes again. Because the light rays hit your lens at a different angle you perceive the image as farther away than it really is. 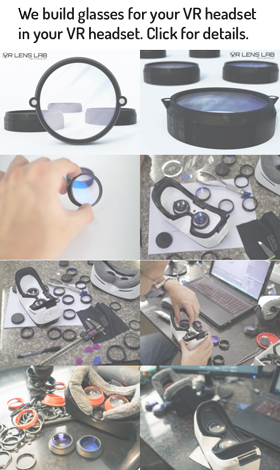 To make the headset lenses thinner and lighter some VR HMDs use Fresnel lenses, which are lenses with the same curvature as regular lenses but they are segmented. But using Fresnel lenses means that you have to make compromises. You can create lenses with many segments, which results in a sharper image. However, you lose light that gets scattered at the peaks that do not have the right curvature. As an alternative you can create Fresnel lenses that have fewer segments, which results in less scattered light and more contrast but will also give you images that aren’t as sharp. These are the basics for understanding how optics for VR HMDs work. Subscribe to our newsletter to stay up to date on all things optic and VR.